This book had interesting information that I had not seen in other sources but because I found several instances where the information presented was inaccurate it put all other information in the text in question. 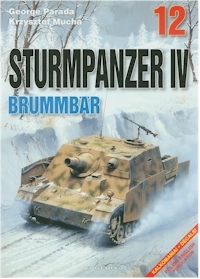 This volume has very few period photographs, about 6, and is mostly color photos of the Munster Series 4 Sturmpanzer. There are also photos of the Aberdeen Series 3 Sturmpanzer and some of a built 1:35 model. The color plates on the inside covers are not very useful with regard to vehicle features because they have combined incorrect features for vehicles they are trying to portray. The line drawings on the other hand are very good and seem to have the correct features for the version being depicted. They did an exceptional job of showing specific features for all version but then neglected to label each so that if you don’t already know which version it is you have no way of telling.